Workplace Business First Aid Kits - Quality first aid kits for your workplace or business. Meet OSHA and ANSI first aid standards and requirements for your workplace with a quality first aid kit from First Aid Only. 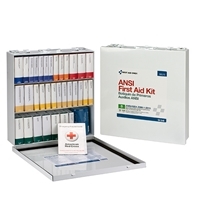 Business Workplace First Aid Kits - ANSI compliant first aid kits hold all 10 ANSI required items in a ready to use first aid kit. Our workplace first aid kits can be wall mounted and feature a handle for easily carrying to the patients side. Our workplace business first aid kits meets OSHA & ANSI/ISEA Z308.1-2009 first aid requirements. Shop for quality first aid kits for your workplace or business online at discounted prices everyday. We feature First Aid Only workplace first aid kits. Westcoastmedicalsupply.com is your online first aid source for first aid kits for business and workplaces. Our First Aid Kits are ANSI approved and contain the required first aid contents in a well organized and easy to use case. Our workplace first aid kits feature easy reordering numbers and tabs to refill your first aid kit, fast and easy, while saving money. Our workplace first aid kits are a great option for industrial settings, business, schools, day care centers, adult family care facilities, restaurants and most general businesses looking to be prepared and compliant.